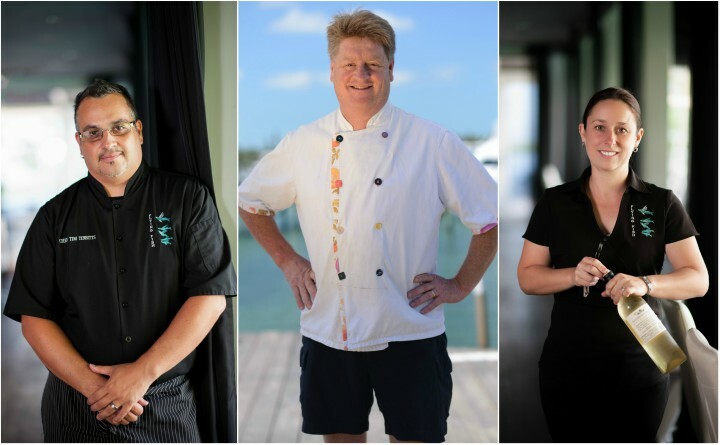 Freeport, Grand Bahama - On June 2nd and 3rd, top Caribbean Chef Tim Tibbitts and celebrity Chef Michael Howell will wow diners on Green Turtle Cay with a collaborative dinner at Green Turtle Club served with exquisite wine pairing options available by the Bahamas’ only certified female sommelier Rebecca Tibbitts. Each chef will prepare and serve 3 exquisite dishes and guests will have the opportunity to interact directly with them. “Our goal is to create an enjoyable, dynamic and engaging experience for the guests” says Chef Tibbitts. On offer from Flying Fish’s owner and executive chef, Chef Tibbitts is the amuse bouche (spherical soup: sweet potato, chilli and lime), grilled calamari, brown butter powder, confit garlic, grape tomato, capers, sneaky olives, caramelized lemon and 72 hour beef short rib, potato gnocchi, heirloom tomato, pine nuts, balsamic caviar, blue cheese, asparagus, pickled shallots, celery. On offer from Green Turtle Club’s very own Chef Howell is watermelon salad, feta and kalamata olive dust, olive oil poached snapper, saffron infused cannellini beans, smoky bacon, pickled snow peas, beet beurre blanc and house made tropical fruit rainbow sherbet and salsa with lychee liqueur. The duo will also host a BBQ lunch on the beach on Friday June 3. “We have enjoyed hosting a great number of high profile international chefs at the Green Turtle Club over the years. I am delighted now to host one of The Bahamas finest chefs and share that experience with my staff, our customers and culinary adventurers ” says Chef Howell on opening his venue up to guest chefs.